Hugh Lane painting robbery (1956) | Come Here To Me! 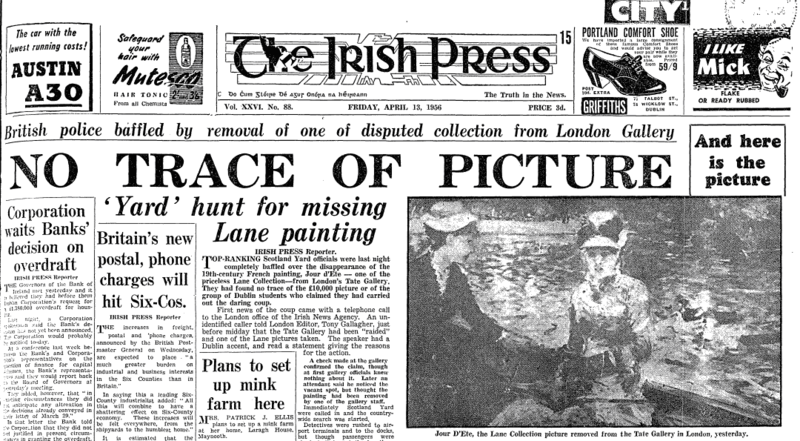 On April 12th 1956, two Irish students stole one of the 39 contested Hugh Lane paintings from the prestigious Tate Gallery in London. 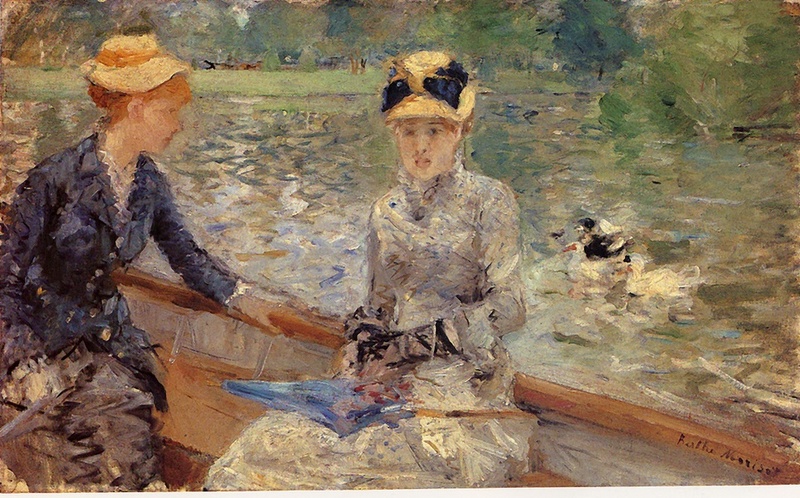 Dubliner Paul Hogan (25), studying at the Dublin College of Art, and his companion Bill Fogarty, a veterinary student from Galway, took the Jour D’Ete (Summer’s Day) by Berthe Morisot and kept it for four days. The painting was worth £10,000, now about £7 million. The action was taken to highlight the popular feeling that Lane’s paintings should have been on display in Dublin and not London. Hugh Lane, a successful art dealer, had originally bequeathed his collection of modern paintings to Ireland but he then made a second will and left everything to London’s Tate Gallery. However, Lane, shortly before he died in a shipwreck in 1915, wrote yet another will leaving everything to a gallery in Dublin. Because no one witnessed this will, the English courts refused to recognise it as a legal document. For the following decades, there were various unsuccessful attempts by those in the Arts community and in the government in Ireland to claim the paintings back. While Fogarty pretended to make a copy of the painting on a sketchpad, Hogan lifted it off the wall and put it inside the large portfolio he had brought with him for that purpose. They worked quickly and it only took a moment to hide the painting. I was to run out the front door with it where a photographer was waiting to take a picture. I thought I would probably then be overpowered. We hoped we would get a modest amount of publicity and force the authorities to do something. We thought we might spend a few days in jail but that would be it. The authority for this action is the codicil to the will of Hugh Lane, dated 1915, bequeathing the 39 treasures to the City of Dublin. This action has been taken in the Irish National Interest. The Irish Press front page. Apr 13, 1956. By 1959, just three years after the raid, agreement was reached between Ireland and the UK that the paintings would be shared. In 1979, London ceded many more (on long-term loan), and in 1993, the Hugh Lane Director, Barbara Dawson negotiated a ‘rotating arrangement’ for the major Impressionist painting. Jour D’Ete finally returned to Dublin in 1999 along with the 38 other pieces. Hogan in later life was employed by Ireland’s Export Promotions Board, Coras Trachtala Teo. Fogarty passed away in 2002. This spurred on Hogan to tell the full story story of their dramatic escapade to RTE Radio. A 26mins documentary, ‘Coup De Tate‘, was made by RTE television in 2003. (2) Paul Hogan, RTE Radio archive, John Bowman show, April, 2008. 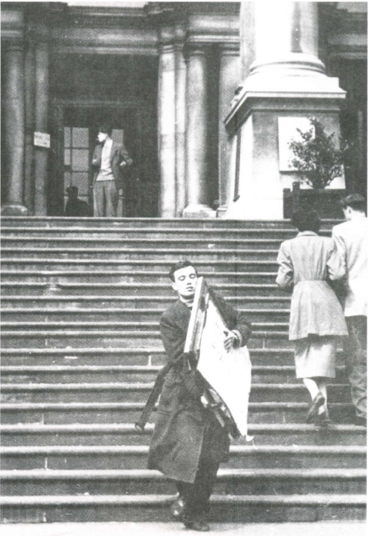 That’s a great story – and a great picture of him escaping down the steps unnoticed. Know the spot well – but surprisingly delighted at the outcome in the circumstances. on November 29, 2012 at 8:08 am | Reply Come Here To Me! is three today. « Come here to me! The female friend who’s flat who’s flat that Jour D’Ete spent 4 nights was one Maura O’Donnell from Galway Fr.Griffin Rd area, she was discribed to me as having either long dark or auburn hair. Mr. Paul Hogan was trying to trace her some years ago. He was anxious to speak to her or find her whereabouts.